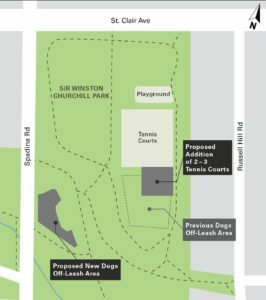 On February 15th the City released its Proposed Changes to Sir Winston Churchill Park Dogs Off-Leash Area and Tennis Courts. A local group of dog owners led by Hilton Avenue resident, Laura William, is campaigning for improvements to the proposed dogs off-leash area. The new area will replace the one in Sir Winston Churchill Park that was closed in 2016 to allow for the rehabilitation of the St. Clair water reservoir beneath the park. The City is proposing a relocation of the DOLA approximately 125m below the reservoir to the south west. The new dog park will be less than half the size of the old one. It’s worth noting that the pre-existing dog park was an extremely busy one, frequently operating at or near capacity. Further, its surface will be pea gravel which is not the best surface for dogs’ paws, is a problem for people who may have stability issues and has been the subject of complaints at other DOLAs in the city. The dog owners group is looking to have the city increase the size of the off-leash area by extending it under the Spadina bridge and up the slope to the street entrance from Spadina Road, mid-way up the reservoir to make the park fully accessible. Further, they want the city to employ a different surface such as wood chips used at Cedarvale Park’s off-leash area. A Formal Complaint has been registered with Toronto Parks, Forestry and Recreation and Toronto Water and a request has been made for effective community consultation before a final decision is made. A meeting was held in Councillor Josh Matlow’s office on Feb. 20th to apprise him of their concerns. A subsequent meeting is scheduled for February 28th. The dog park is scheduled to open before the end of this year. The City has issued an Update Report on the changes proposed for the Dogs Off-Leash Area and the Tennis Courts at Sir Winston Churchill Park. This update follows the drop-in event held in December to get community input. City staff are continuing to review feedback and will be making final recommendations on the proposed changes. We will keep you posted. February 13, 2019 / CLRA / Comments Off on Committee of Adjustment Defers Application for Day-Nursery at 105 Wells Hill Ave. The Committee of Adjustment this afternoon deferred the application for a day-care facility at 105 Wells Hill Avenue. The CLRA has been working closely with our residents and Councillor Josh Matlow and his team to obtain a deferral to allow for further study of safety and traffic congestion issues related to the location of the proposed day-nursery on a narrow and blind curve. Twenty residents filed objections with the Committee of Adjustment for reasons of safety and traffic congestion. The CLRA has not seen this level of opposition before. Our reason for the deferral was to ensure a big mistake wasn’t made where we would end up with a dangerous situation and extreme frustration for the whole community. We congratulate Nick Saint-Martin and Robert Levy for their tenacious and effective leadership here and Councillor Josh Matlow and his team who embraced the concerns raised by the CLRA that more study was needed given the potential impact on the safety of our community. The Committee of Adjustment is scheduled to meet tomorrow at 2:30 pm to decide on the application for a day-care facility at 105 Wells Hill Avenue. The CLRA has been working closely with our residents and Councillor Josh Matlow and his team to obtain a deferral of this meeting until further study and impact can be done. A Transportation Opinion letter prepared by TMIG | The Municipal Infrastructure Group Ltd commissioned by resident Nick Saint-Martin contradicts several assertions in the transportation study prepared for the party bringing the day-care application to the Committee of Adjustment. It demonstrates the need for further study before any decision can be taken. More than a dozen residents have filed objections with the Committee of Adjustment for reasons of safety and traffic congestion. The CLRA has not seen this level of opposition before. We want to ensure we don’t make a big mistake and end up with a dangerous situation and extreme frustration for the whole community. A deferral to allow for further study is the best option at this time. February 7, 2019 / CLRA / Comments Off on CLRA Submission to Committee of Adjustment re: 105 Wells Hill Ave. The Casa Loma Residents Association supports a review by Transportation Services, City of Toronto to evaluate the risk to public safety and traffic congestion that may result from the operation of a proposed day-care facility at 105 Wells Hill Avenue. This property is the first house on Wells Hill Ave. south of St. Clair Ave. on the blind curve between Melgund Rd. and St. Clair Ave. adjacent to Wells Hill Park. This section of Wells Hill Ave. is also scheduled to be narrowed by 1.5 meters by the installation of a sidewalk on the east side which was not discussed or communicated to our community. The day-care facility is intended to serve 37 toddlers and operate with a support staff of 9. The current documentation on file with your Committee does not provide adequate information with respect to the traffic generating characteristics and peak parking demands associated with the proposed day nursery as it relates to staff parking and the forecasted vehicle drop-off/pick-up activity during either the morning or afternoon peak arrival periods. 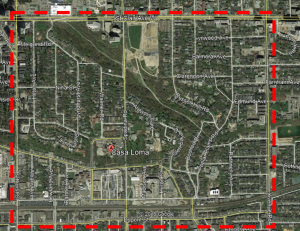 Many residents of the Casa Loma neighbourhood have expressed concern for the safety of children being dropped off at the proposed daycare and the congestion that will result from cars backing out of the driveway at 105 Wells Hill Ave. or stopping on this curve leading either from or towards St. Clair Ave. This leads to increased risk of accidents between vehicles and pedestrians. 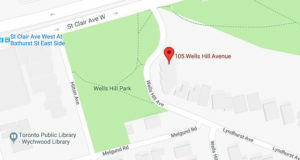 The CLRA is a supporter of more day care facilities to service our neighbourhood but believes it is completely premature to approve the location at 105 Wells Hill. The CLRA also believes a study by the City of Toronto Transportation Department is necessary to address the many concerns presented to the Committee of Adjustment by neighbourhood residents. Accordingly we request that the Committee oppose the application or, in the alternative, defer consideration of the application until the City’s Transportation Services department has had the opportunity to properly study the impacts and potential hazards of this proposed conversion. Link to the Application Information Centre for all filed documentation. This is a followup to our original posting. Annabel Weinstein has been staying in touch with Josh McMeekin, Inspector, Forest Health Care for the City of Toronto. We have now been informed that, subject to City Council approval, Urban Forestry is planning on conducting an area wide aerial spray over the Casa Loma neighbourhood with a helicopter in the spring of 2019 in order to control the rising population of gypsy moth in our area. The City will hold a community meeting about the 2019 Gypsy moth control program in the Casa Loma neighbourhood, most likely in late February-March. In order to try and make the best use of time in this presentation, Urban Forestry would like a list of questions, concerns and/or topics that people would like to be covered during this session. This will help Urban Forestry prepare, and organize a presentation to better cover the topics of interest/concern. with your questions, concerns and topics you would like covered in this meeting before the end of January. As soon as we know the meeting date, we will post it on our website and email our members. Work on the northwest section of the park has been completed one year ahead of schedule. Due to the early completion of this work, the northwest part of the park will re-open in December 2018 (please refer to map below). The remaining areas of the park remain closed and are scheduled to re-open in the fall of 2019 as per the original project timeline. Drop-In this Tuesday Dec 11th at Timothy Eaton Church between 6:30 pm and 8:30 pm to hear about plans for the tennis club and dog park and give your input to park officials. The City of Toronto has engaged WSP Global Inc. to advise on improvements to the traffic and parking problems related to events at Casa Loma. A public Drop-In event for the Casa Loma Transportation Management and Mitigation Plan (TMMP) was held November 6th at the Toronto Archives Building on Spadina Avenue. The City plans on a follow-up meeting early in the new year after more feedback from the community and further study and evaluation of various alternatives to solve the traffic and parking problems. The City is maintaining a website to keep us posted. us with your comments and suggestions. We will be adding them to this posting and passing them along to the TMMP team so that our residents will have a voice in the process. The CLRA will also be organizing a meeting and making a formal submission as part of the TMMP review. This will be communicated by email to our residents and by posting on our website. Residents who live on Walmer and Castleview are experiencing serious traffic congestion as cars look for parking spaces on those streets; many times there is double parking as cars wait for Casa Loma visitors to be picked up. Visitors to Casa Loma are precluding residents and their guests from parking on Walmer and Castleview. Residents with overnight parking permits on Walmer and Castleview cannot find parking until after events are over. Drivers searching for parking spaces on Walmer and Castleview are distracted and pose a risk to neighbourhood children. Pedestrians crossing Austin Terrace to reach the castle from the sidewalk at the corner of Austin Terrace and Walmer Road are put at risk maneuvering between traffic exiting the parking lot, exiting Walmer Road and proceeding both ways on Austin Terrace (at times at high speed), particularly because of the sharp and largely blind turn on Austin Terrace immediately west of the Castle. Visitors exiting the Castle on to Walmer through the Stables or who are waiting for a pick-up at the corner may be boisterous at times (there was a serious personal injury fight in October) and are not reminded by signage that they are in a residential neighbourhood. Some bus tour visitors and others occupy the front lawns and patios of residences on Austin Terrace while waiting for their buses, asking for water, use of washroom etc. as if they were still on public property. Any expanded use of the Stables and Pellatt Lodge either by Casa Loma or other tenants will only exacerbate the congestion and noise issues and should be addressed by the City in the upcoming lease renewal. (These suggestions are those made by area residents for review and discussion; they may be mutually exclusive and not every resident may be in agreement. The CLRA is in the process of getting input from its members as we engage in discussions with our councillor Josh Matlow, City officials, its consultants and the Liberty Entertainment Group). Eliminate the taking of a parking fee on entry and instead take payment on exit or use automated payment machines such as those at Green P lots. Place lighted signage, electronically controlled by the attendant at Casa Loma, advising when the lot is full and directing traffic to alternate lots at George Brown and Bridgman so that traffic heading to Casa Loma from the south does not enter Austin Terrace and from the north proceeds past the Castle without stopping. Have Casa Loma operate a shuttle service from the St. Clair West subway station during major events to the DOPU area. Re-design the home page of the Casa Loma website to advise of (1) public transit alternatives (St. Clair West Subway, Dupont Subway, and 127 bus, including walk times) and (2) parking alternatives so that this information is prominent, including on mobile devices. Casa Loma should provide to the CLRA for posting on its website an advance shedule of events, quarterly or monthly as needed. Widen Austin Terrace in front of the castle by moving the south sidewalk so that it is adjacent to the Casa Loma wall and construct a minimal amount of new road space on the north side to accommodate the 2 lanes of through traffic and a Drop-off/Pick-up lane in front of the Castle. Consider taking some of the space at the north end of the Baldwin Steps park for a DOPU area. Put signage at exits to the castle and stables reminding people they are in a residential area and asking them to respect private property and keep noise and litter to a minimum. Change the exit from the stables from the east side to the south side. Employee parking should not be allowed at the Stables as the driveway is entered from Walmer Rd., a residential street. Employee parking should be limited to the Casa Loma parking lots or the lots at George Brown and Bridgman. Limit the number of days for the Legend of Horrors event; every day is too excessive. Parking permits should be made available to residents of Walmer Rd. and Castleview Ave. on a 24 hours/7 days basis and include 3-5 visitor permits which could be used by their guests on a temporary basis. Install rectractable automatic bollards on Castleview at Spadina to prevent traffic from entering Castleview and Walmer during major events; residents would use an electronic mechanism to obtain access for themselves, guests and trades/delivery people. The City should ensure parking enforcement officers on on duty at the times of Casa Loma events. Install Bike Share in a suitable location and other bike parking at Casa Loma. The Winston Churchill Park will reopen by the end of next year. The City is holding a Drop-In Event on Tuesday Dec 11th between 6:30pm and 8:30 pm at Timothy Eaton Church to show us the plans. The Dog Off Leash Area (DOLA) will be moved down the hill as the Water department has determined that dog pee may leak into the new reservoir. Unfortunately, the proposed area is smaller than the previous DOLA which was already overcrowded on busy summer days. The location of the new DOLA will not impact the protected environment of the ravine. They are considering adding 2 or 3 unlighted tennis courts to the 10 that were previously there. They also say there will be no more changes for 75 years! The Winston Churchill Park is a great benefit to our neighbourhood and I’m sure the tennis club, jogging/running paths, playground and dog park make a difference not only to us but to others who will move into our neighbourhood over the next 75 years. We are pleased to report that thanks to the persistence of JoAnn Breitman and the stewardship of Councillor Joe Mihevc and his staff, the City of Toronto and Liberty Entertainment have formalized by Agreement the commitment made by Liberty Entertainment and first reported on in June this year. October 20, 2018 / CLRA / Comments Off on Traffic Study Information and Drop-in Event Tuesday November 6th. The City of Toronto has engaged WSP Global Inc. to study and address traffic and parking congestion in the Casa Loma neighbourhood generated by special events at Casa Loma. 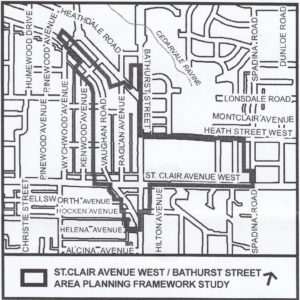 The study area, as shown on the map below, is bounded to the north by St Clair Avenue West, to the west by Bathurst Street, to the east by Avenue Road and to the south by Dupont Street. The City and WSP would like to hear from area residents about our neighbourhood traffic conditions. We encourage you to attend the upcoming drop-in event to learn about the study and provide your input. 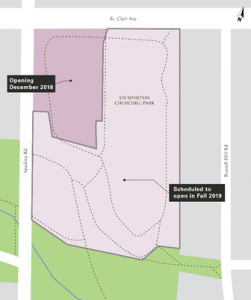 map provided by WSP Global Inc.
Construction has begun on the Wychwood Library expansion and modernization. The library will be closed until work is completed, expected in late 2020. The expansion will add nearly 11,000 sq. ft. of space or about 9,000 sq. ft. net of the demolition of the 1978 addition. 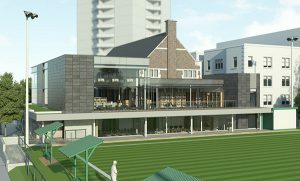 The expanded library will also accommodate the new clubhouse of the Wells Hill Lawn Bowling Club whose original clubhouse will be demolished. The capital budget for the project is $15.8 million of which $1.5 million has been paid by purchasers of the Rise Condominium as part of the city’s Development charges for that project. 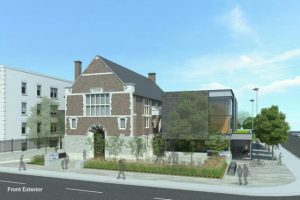 The renovated library will have several lounges with generous views of the street or lawn bowling green outside, a new early literacy centre, a new theatre and a digital innovation hub. Any construction road encroachment will be on Melgund Road, not Bathurst Street. Interested in a round of golf with your neighbours? The Casa Loma Classic, the annual neighbourhood golf outing will be held this year at the Upper Unionville Golf Club on Saturday September 15th at 9:50 AM. Cost for 18 holes including power cart is $86.25 plus HST. Upper Unionville is a Doug Carrick designed course that was formerly the Mandarin Golf Club. It reopened in 2017 under the ownership of the highly regarded Copper Creek Golf Group. Picturesque and challenging, the course plays a reasonable 5742 yards par 72. Located on Kennedy Road, north of Elgin Mills, it takes about 40 minutes to drive there on a Saturday morning. MAP. Car pools will be organized from the neighbourhood between 8:00 and 8:30 AM. This is a fun event with the added attraction of the winning foursome being awarded the Casa Loma Classic Trophy and Plaid Jacket to be treasured for the following year. In order to organize balanced teams, please include your usual score for 18 holes when you sign up. Ward 21, supported by our Councillor, Joe Mihevc, was chosen as one of four wards in the city to participate in The UrbanHensTO pilot program. This program, which runs from March 2, 2018 to March 2, 2021, allows residents to have up to 4 hens, but no roosters, in their backyards. Residents must register the hens with the city and comply with regular inspections. City Council approved this initiative against the recommendations of their own staff who were concerned about health issues. The following email was sent today by the CLRA to Councillor Joe Mihevc. The CLRA is not in favour of this program. There is no reason for our neighbourhood to be taking on the risks and noise and dangers of the backyard urban program. I would ask you to immediately stop your support of it. As you know City staff was also against it and recommended against the program. Your pilot program is indefensible – and to say it is “only” for 3 years is ridiculous – that is an extreme amount of time and much damage can occur then, including the passing of disease to humans. It is not safe and adds no value to us – only noise and filth. Chickens are not pets and food sources in the city. There can never be proper monitoring and enforcement of regulations by the limited resources at the City, and there is no reason to believe that people will or can adhere to any regulations, which are completely insufficient to begin with. If you insist on this it can be done in a more restricted setting like the Riverdale Zoo or at the Barns. Please stop this program and get rid of all backyard chickens immediately. There are stronger reasons against them than for them. Stop wasting any more taxpayer money or time on it. Stop all the disease and noise and filth that will come from these chickens! On July 12, 2018 The Toronto Preservation Board approved the recommendation of the City of Toronto’s Planning Division to proceed from the Study Phase to the Plan Phase to designate two areas of our Casa Loma neighbourhood as Heritage Conservation Districts (HCDs). Two HCD Plans will be developed: The Hilton Avenue HCD Plan and the Wells Hill Avenue HCD Plan. In addition the Toronto Preservation Board approved City Planning’s recommendation to evaluate 63 other properties in our neighbourhood for HCD and in some cases for Part IV designation. Further details are on our website. Neighbours have noticed a large number of gypsy moths on the many oak trees in our neighbourhood. The moths are now at their caterpillar stage where they have the potential of destroying our beautiful tree canopy. We are in touch with the Urban Forestry department who are monitoring the situation. 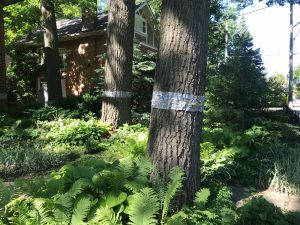 The city has sprayed trees on city property in 2007/2008, 2013/2014 and 2017. The infestation this year has not warranted a spraying or other ground treatments. If these moths are not controlled, severe loss of foliage can take place within a few years. The City does not treat trees on private property but does provide information on the appropriate treatment. Please CLICK HERE for their guide. Some homeowners have taken steps to stop these red spine caterpillar creatures from crawling up tree trunks so they cannot defoliate the leaves above. They wrapped duct tape around the tree trunk and then placed petroleum jelly on top of the duct tape. Annabel Weinstein is in communication with Urban Forestry to stay on top of this issue. We are looking to organize an information meeting this fall or winter so residents are equipped to deal with any outbreak next spring. 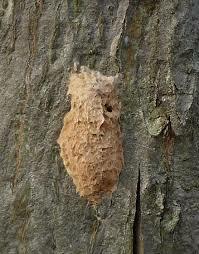 Before next spring keep an eye open for their egg masses which will accumulate on trees through the fall and winter. Scrape off egg masses with a dull knife or use a vacuum and place them in soapy water for a few days before discarding them in the garbage. If they fall on the ground crush them with your shoe. JoAnn Breitman and Councillor Joe Mihevc met on June 7th with representatives of Casa Loma, which is managed by Liberty Entertainment Group (LEG). Among the issues discussed were noise, parking and traffic issues impacting our neighbourhood. LEG has made improvements to their sound system by putting speakers in rocks so they are low to the ground, changing direction of the sound, and increasing the number of speakers so that individual speakers don’t have to be as loud and the sound is not transmitted as far. They have committed to keeping sound levels at 65 decibels or lower and ending their Symphony in the Gardens (Tuesdays June 5 – Aug 28), Soul in The City (Mondays June 18 – Aug 27) and Just For Laughs Comedy in the Castle (Wednesdays July 25 – Aug 29) events at 9:30 rather than at 10 pm as has been past practice. Weddings will no longer have live bands outside. There will be DJs outside but the sound system will have a “limiter” which cuts off music if it goes above 65 decibels. Weddings will go to midnight. The City has agreed to monitor this during the summer. LEG has committed to keeping all of the screaming/ fright effects inside for this year’s Legends of Horror event which runs for the month of October. The Italian Day on June 3rd. highlighted the need for stricter parking enforcement and a traffic control plan. This especially impacted residents on Walmer Road and Castleview Avenue. Traffic congestion in front of the castle was also very severe as there are no warning signs, say on Spadina or Davenport, informing attendees that the lot is full. LEG will open the South Gate for access as a convenience for those parking in the George Brown lot or taking public transit and will use several mobile signs around site entry points north and south to discourage drivers from heading directly to the castle parking lot. This summer, Joe Mihevc will ask for stricter parking enforcement (ticket and tow) during events. Other measures will wait on the completion of a consultant’s study that LEG has commissioned for this summer and fall. The renovation of the exterior of Casa Loma is ongoing which leads to issues related to the construction staging and debris disposal, which are concentrated in the vicinity of the stables. Rod Jones, Director of Bylaw Enforcement has recently inspected the site and will report to us.